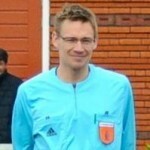 Dutch Referee Blog has launched a weekly Laws of the Game quiz. You can use them for practice (anonymously) or take part of a competition to win some small refereeing goodies. Your e-mail address will NOT be shared with someone else. You write the e-mail address down so I can get in touch with you for your postal address if you have won. I’d love you to get my weekly newsletter, but that happens only if you really want to receive it. If yes, tick the box at the last question. So you will NOT automatically get the weekly newsletter. You can take part in the quiz until exactly 7 days (Friday at 12pm CET) after the last quiz of the month has been released. After that the quizzes are still available online, but you can’t win prizes any more. A winner will be randomly selected under participants who scored the most points (every correct question is 1 point) in a month. If you want your weekly scores to be summed up, make sure you write down the same email address and user name every week. The winner will announced on Dutch Referee Blog or it’s social channels and also will be contacted via the submitted e-mail address. The winner needs to reply within two weeks notice after the announcement to give his postal address, otherwise another winner will be selected.